The Annual General Meeting of the Fan Circle International took place in Cheltenham from 12 evening to 16 May 2016. This year's topics reflect the main focus areas of the region: Horse racing (the Cheltenham Gold Cup is one of the major jump races) and music and literature (referring to the Cheltenham art/literature/music festivals). 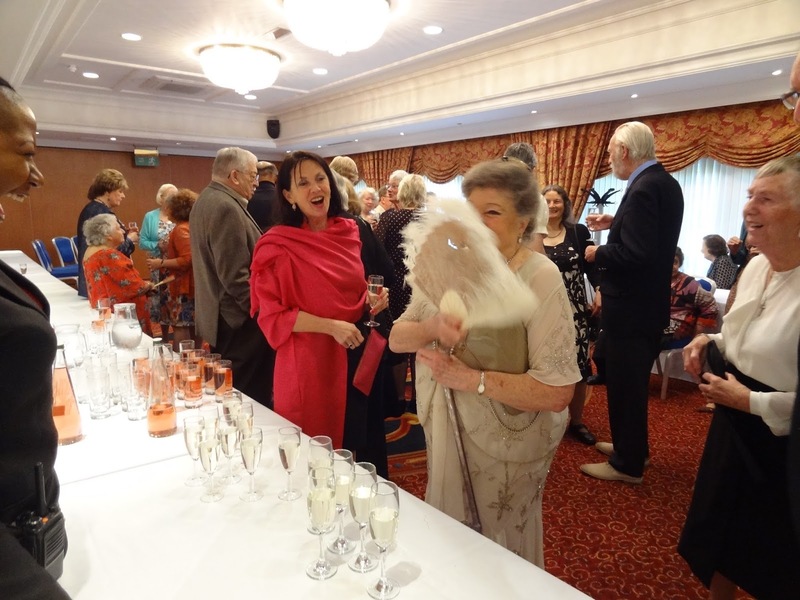 Sunday, 15 May was the culmination with sale, auction, lectures and the Gala Dinner. Margaretha Mazura gave a presentation on "Horse racing on fans". "A day at the races" I called my presentation on horse racing on fans, but this report is rather "A day at Cheltenham", exactly the Sunday 15 May 2016. How lovely to meet all the FCI members whose names were familiar from e-mails and Bulletins in person! The morning started with the fan sale - all members already queued up when the doors opened at 9.30 am. What a treasure trove! One could have easily staffed an entire museums with the fans on sale and would have had a high-level representation of fans of all epochs. Then followed a lecture on a local 18th century painter who also engaged in fan paintings, followed by the AGM. After a light lunch, I held my lecture on horse racing with a small exposition of my fans. And then the auction for the benefit of the FCI. What a pity that I did not come by car: Kilos of old FCI Bulletin and FANA journals - too heavy to carry, alas. The Gala Dinner was honoured by the presence of the Mayor of Cheltenham and his wife - when she saw the "Ruby Fan" displayed, she definitely got infected by the "fan fever". A big thanks to Anne Marie Benson and Sue Angell and all other FCI organisers for this perfect, lovely, convivial event! Enjoy the photos below - and if you are not yet an FCI member - join us! 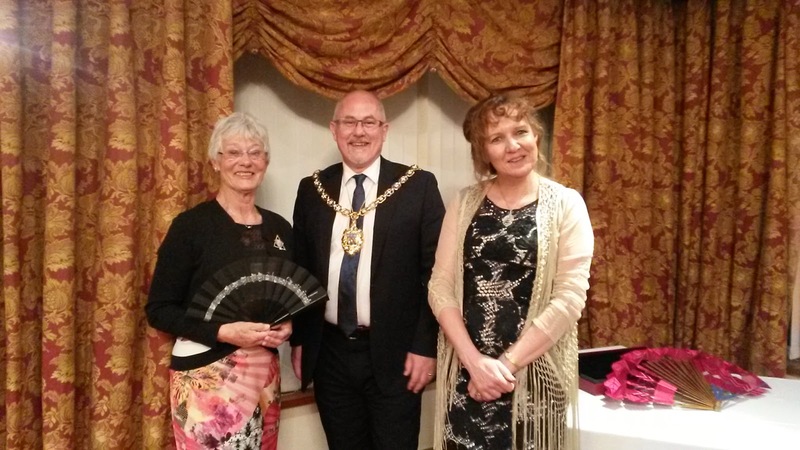 Fransje Hoovinga Van Eijsden, President of FCI, the Mayor of Cheltenham and his wife; in the background the "Ruby Fan"